Do you want to feel optimal, nourished, restored, recovered & feed your body’s vital force every day? Incorporating this super smoothie into your daily scope will give you that optimal health you want whilst maintaining effective function of all your bodily systems. My life force smoothie really is the mother of all smoothies due to its high levels of essential vitamins, minerals, antioxidants, digestive enzymes, pre biotics, pro biotics, proteins, EFA'S, plant sterols, dietary fibre, alkalizing, anti inflammatory, vegan & low GI. So what are you waiting for, get your blenders out & make it happen. Fresh Turmeric: The chemical curcumin is the active ingredient in turmeric that works as an anti-inflammatory agent & is rich in minerals, antioxidants & vitamins like B6. Slippery Elm: Essential for optimal digestive function as it soothes inflamed mucus membranes in the digestive tract & aids effective absorption of nutrients. 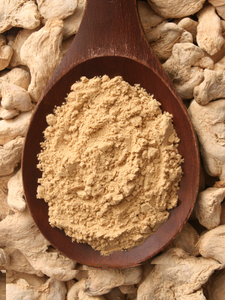 Fresh Ginger Ginger increase cardiovascular circulation, digestion & is used traditionally as an anti-inflammatory. Ginger is also rich in Antioxidants. Chia Bran Chia Bran is a husk meaning it’s naturally rich in dietary fibre. The fibre in Chia Bran is 80% insoluble and 20% soluble fibre which is the optimal ratio to aid healthy digestion. Pea Protein Per serve you will get around 22g of anti-inflammatory Protein, an alkalizing PH level of 7.5 & a rich source of plant sterols for healthy cholesterol. Spirulina Nature’s natural multivitamin, a complete protein & rich in 1000’s of phyto nutrients particularly high in vitamins A & B complex. Chlorella Nature’s natural multivitamin & your body’s daily detoxifier. Pulls heavy metals like mercury & other toxins from the body. High levels of Vitamin D.
Barley grass Nature’s natural multivitamin, alkalizing, with nearly 30times more calcium then cow’s milk, 7 times the vitamin C or oranges & 5 times the iron content of spinach. Wheat Grass Nature’s natural multivitamin, alkalizing, 44% of your RDI of Iron & high levels of vitamins A, E & B complex in particular B6. Kale Rich in protein 2.5g per cup, vitamin A 300% RDI per 1 cup & 89% of your RDI for vitamin C per 1 cup. 1. Chop up your banana & add into your blender with your fresh or frozen blueberries. 2. Add in all of your dry ingredients. 3. Tear your kale leaves off the stalk & add into your blender along with the freshly diced turmeric & ginger. 4. Pour in your filtered water cover & blend until smooth. 5. Serve in large glass & enjoy.